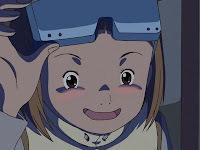 Tamers is often referred to as Serial Experiments Lain meets Neon Genesis Evangelion for kids. We've seen a few random Lain-ish moments in the first twelve episodes, but nothing from Eva and plenty of “for kids.” This time, we're treated to equal parts of all three as we're thrown between Yamaki playing Gendo, MIB agents visiting Janyuu and Takato hoping the bad man won't take his pet monster away. For the first time, there's an air of legitimacy with Yamaki. His prior efforts had been ineffectual to say the least. For all of his harsh orders, menacing looks and threats to children, his actual rate of success is on par with the likes of Dr. Doofenschmirtz. One element quickly makes him an instantly respectable character and makes his new plan appear to be big trouble. It's an element yanked straight out of Evangelion- pressure from the higher ups. Usually the Eva comparisons arise from the ending of Tamers, where the children bionically fuse with giant monstrosities in order to fight off agents sent by a force bent on destroying humanity. Yamaki having to deal with both disdain from below and above is very reminicient of Gendo Ikari. From below, neither Riley nor Tally seem all that in love with their jobs. They gripe about long hours and their lack of knowledge about the very system that they are trying to monitor. Even a visit from Calumon is only able to cheer Tally up for a few seconds before Riley convinces her that it wasn't real. From above, Yamaki's conference call may as well have been a meeting with SEELE as he gets grilled from all sides, most concerned with their own necks (or golf game). He needs to pull something big in order to win their favor, and that means he has to get desperate. Hypnos provides the Lain pastiche as well this episode, thanks partially to the clever integration of exposition into the conference call. When one guy was too busy working on his putts to read the briefing, a woman explains to him (and us) the origin of Digimon as a college experiment to create artificial life and how even after the project was shut down, the Digimon continued to evolve, gaining the ability to synthesize proteins to take form here (everybody got that?). 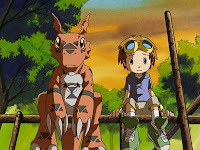 It's all heady stuff, and the first time any series has attempted to explain the genesis of Digimon or how they can exist in a non-data environment. 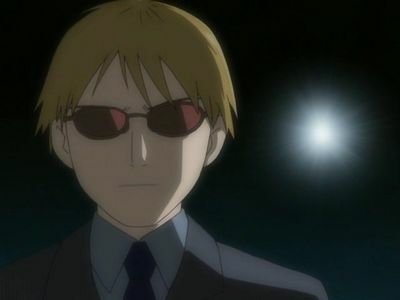 The Lain stuff really hits when Janyuu is visited by an MIB agent regarding his role in this, asking about one particular researcher but vanishing as Henry shows up. And yet, all this cool edgy stuff doesn't overshadow the main point of the show- the relationship between these three kids and their Digimon. Rika and Renamon get a brief moment to patch things up, with Rika admitting therapeutic benefits to not seeking conquest and victory all the time. The bulk of the narrative is with Takato as he suddenly has second thoughts about Guilmon getting stronger. A nasty battle that ended in smoke bombs and a Yamaki visit has Takato realizing that he can't just be with Guilmon to screw around. The dilemma he faces is that if the situation requires that Guilmon get stronger and evolve further, how long will it be before Guilmon stops being Guilmon and becomes something unrecognizable and undesirable to Takato? This is where the slow pace early on pays off, as all of this happening at once makes the episode feel more frenetic than it really is. It's actually a steady crescendo, capped off by the release of the Juggernaut program that immediately gets Guilmon and Terriermon's attention. Even with no rational basis to take Yamaki and Hypnos seriously before, suddenly you know that it's real this time, and that something insane is going to happen in the next episode. How badass can the start of an episode get? The conclusion of a battle in silhouette followed by smoke bombs and Yamaki stealing away with DarkLizardmon. It sets an immediate dark tone that informs the whole episode. For everything previously stated about the Hypnos building being a real life city hall, it's still easy to get chills when the building just appears through the fog like it does here. As if this episode didn't play with Eva tones enough, the research on DarkLizardmon is conducted in a room full of cooling pools and fossils on the walls. It's hard to tell if this is happening floors above street level or miles under it. What was the point of the scene with Miss Asaji other than to show Takato's dear teacher with a raging hangover? How meta is it that Terriermon was playing the Digimon card game on the computer? 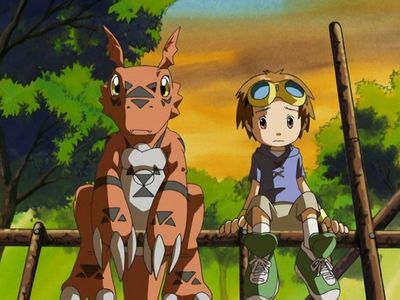 While Takato's drama was ultimately insignificant as Guilmon talked him off the ledge right away, it's admirable that Guilmon was able to do it, with some mature viewpoints that he wouldn't have been capable of just a few episodes ago. Strange enough that Miss Asaji was featured in a pointless scene, but so is Henry's older sister, the one with no bearing or relevance to the plot. She's even voiced by Wendee Lee. Wait, was this the episode where Calumon sings his little song? "Calumon zoom zoom, here zoom, there zoom, Calumon zoom zoom, no UNDERWEAR zoom!" Awesome moment, probably not nearly as good in the original Japanese. Man, I felt sorry for that DarkLizardmon. Blown to bits and then utterly wiped out of existence. That said, I suspect the bio-emerge explanation is a bit iffy. Quite apart from the fact that it's near-impossible to get enough raw proteins out of the atmosphere to assemble a flake of skin, never mind a whole animal, they burst into absorbable data when they die anyway. I think the other seasons succeed precisely because they don't bother trying to explain away real-world manifestations of Digimon. The audience isn't going to care that much, since the premise of the show is that the Digital World is a world created as a byproduct of real-world data use and creation.